The outlook for many high school graduates is more challenging, as Vynny Brown can attest. Now 20, he graduated two years ago from Waller High School in Texas, and has been working for nearly a year at Pappasito’sCantina in Houston, part of a chain of Tex-Mex restaurants. He earns $7.25 an hour filling takeout orders or $2.13 an hour plus tips as a server, which rarely adds up to more than the minimum, he said. He would like to apply to be a manager, but those jobs require some college experience. Most young workers have the same problem as Mr. Brown. Only 10 percent of 17- to 24-year-olds have a college or advanced degree, according to a new study by the Economic Policy Institute, although many more of them will eventually graduate. And for young high school graduates, the unemployment rate is disturbingly high: 17.8 percent. Add in those who are underemployed, either because they would like a full-time job but can only find part-time work, or they are so discouraged that they’ve given up actively searching, and the share jumps to more than 33 percent. Younger workers have always had a tougher time finding a job than their older, more experienced counterparts. Even so, the economic recovery has progressed more slowly for young high school graduates than for those coming out of college. “It’s improved since the recession, but it’s still pretty poor,” said Elise Gould, a senior economist at the Economic Policy Institute, who noted the average hourly wage for high school graduates had declined since 2000 despite increases in the minimum wage in some places. Ms. Gould is part of a growing chorus of economists, employers and educators who argue more effort needs to be put into improving job prospects for people without college degrees. “Without question we have failed to pay attention to and invest in opportunities for young people who are not on a path to go to four years of college,” said Chauncy Lennon, the head of work force initiatives at JPMorgan Chase, which has started a $75 million program to design and deliver career-focused education in high schools and community colleges. For high school students, a four-year college education is frequently held out as the only viable option, precisely because job opportunities and wages are so much better upon graduation. But many who sign up never finish. “The most common reason they fail to complete is that they need to start earning a living to support their families,” Mr. Lennon said. Vocational, career and technical high schools have often been stigmatized as a last resort for underachievers. At the same time, educators and administrators in some places have been criticized for steering minority students toward them in lieu of academic programs. The initiative sponsored by Chase is aimed at repairing that reputation. Although some traditional middle-skills opportunities for construction and clerical workers are shrinking, Mr. Lennon said, others are growing. In health care, for instance, radiology and phlebotomy technicians are needed; in advanced manufacturing and aviation, mechanical maintenance workers are in demand. He added that vocational schools should no longer be thought of as dead ends, since they can serve as steppingstones to associate degrees at community colleges or to enrollment at four-year institutions. 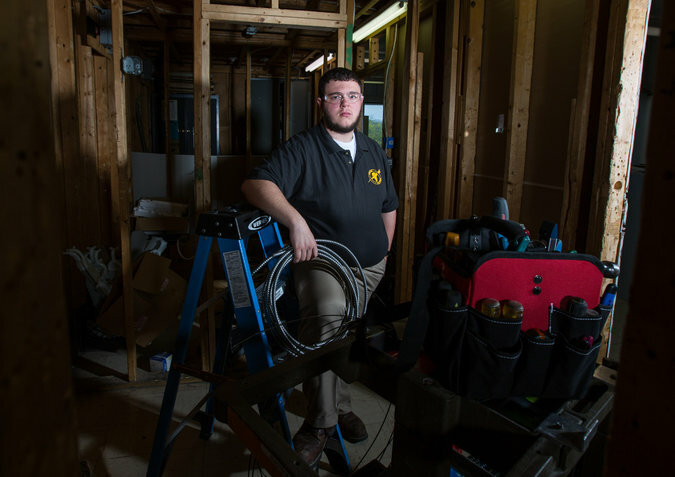 Issac Cardoso, who is graduating from Medford Vocational Technical High School in Massachusetts in June, already has a job lined up as an electrical apprentice, earning $12 an hour. “I went into vocational school with my heart set on the automotive program, but I fell in love with electrical and saw a bigger future for myself,” Mr. Cardoso, 17, said. He is also applying for a coveted spot as an apprentice with the local electrical union, where the starting pay is $18.25 an hour. As an apprentice, he could work while training to become a journeyman, a position with an hourly wage of $28. Most of Mr. Cardoso’s classmates also have jobs waiting for them, he said. Stefanie A. DeLuca, a sociologist at Johns Hopkins University, is the co-author of a study of low-income African-American millennials in Baltimore titled, “Coming of Age in the Other America.” She agrees there is a pressing need for more targeted, streamlined vocational programs in high schools and at community colleges. Still, low wages combined with rising housing costs make it tough to get ahead. “They’re juggling a job at Potbelly and a security job and working 60 hours a week and it’s still not enough,” she said. Despite the improving job market, what particularly troubled Martha Ross, a researcher at the Brookings Institution in Washington, were the 3.2 million disadvantaged youths between 16 and 24 who were not in school and did not have a job. “The size of that population was bigger than I expected,” said Ms. Ross, who is the co-author of a paper on youth employment across the country. Although metropolitan areas can vary widely, the report found, in some communities, young blacks and Latinos are three to five times more likely than whites to fall into this group. If things are tough for high school graduates, for those without a high school diploma, the job hunt can be grim. Adam McKinley, 18, said he dropped out of his high school in Baltimore last year because he needed to work full time. He worked briefly at Dunkin’ Donuts and has searched for jobs at coffee bars and restaurants, hotels and warehouses. Because many of the applications were online, Mr. McKinley said he did not know why he never heard back.